Pair of soft leather mittens, joined at the top with strong leather clasp and D-ring, with 1-inch wide leather buckle strap around the base. The overall length including the D ring is 12 inches. The buckle strap is adjustable from 13 inches to 20 inches. 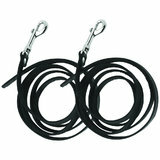 Use with tethers or door jam loops attached to the D-ring for best results!